Some people would say the 10K distance is among the hardest to race, similar to the pain of 5K but over twice the distance! It is even more challenging to prepare for a 10K on a midweek evening; however the Yateley 10K series always seems to sell out really quickly so what is the appeal? For me it is the relatively cheap entry price, a midweek race that coincides with my usual running evening so does not encroach into the weekend and the chance to run with my wonderful teammates at Blackwater Valley Runners. Oh yes and the post-race visit to the pub! The races are usually held on the first Wednesday of June, July and August. Last year I participated in the Yateley 10Ks for the first time although unfortunately was not able to make Race 2. This year I was determined to make all three races. After each race you are given a medal and when you have all three they interlock in a very clever way. After recovering from my April marathon and setting a 10K PB at Bognor in May I had high hopes for some good times at Yateley. What I had not quite factored in was the weather and also the course which if not hilly is certainly undulating! The first race in June took place on a particularly warm evening. I had probably not kept myself hydrated enough in the days leading up to the race and felt I suffered especially at the end of the race. No 10K PB but a reasonable time and certainly a lot faster than my best Yateley time last year. The weather for Race 2 was a bit kinder, not quite so warm and it had rained a bit earlier on in the afternoon which took the sting out of the heat. I decided to aim for around 52 minutes (I managed just outside 53 minutes in the first race) and Rob Ostler kindly agreed to pace me. Being paced by someone definitely helps, you just have to hang on in there and keep up with them! Easier said than done! I was feeling okay even up to 5K, but by 8K it was really hard work! I certainly did not talk much at all during that race. But in the end I actually not only managed to finish under 52 minutes but my time was actually a 10K PB! Result! I had obviously pushed myself so hard that it was the first time I actually threw up after finishing a race. Goodness me that was a tough race though! After the success of Race 2 I had high hopes going into Race 3. Well a month on and surely I could improve on my time of Race 2? Er no, it was not to be. With hindsight I probably went off a little fast and paid for it in the latter stages. My time however was only 30 seconds slower than my PB from Race 2. Overall a big improvement on my times from 2017 although I am glad I am not running any more 10Ks for a while! 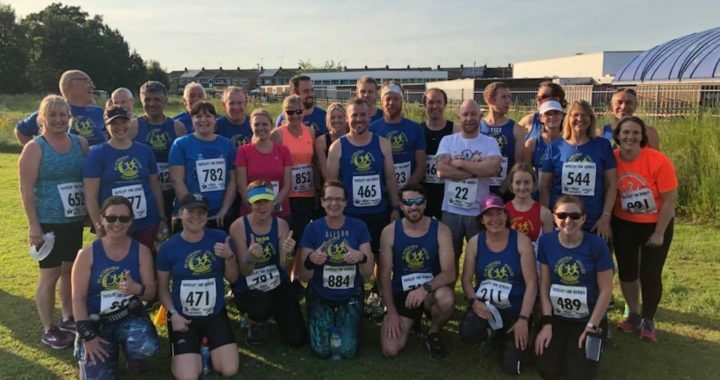 There were lots of great runs and times and PBs from so many other Blackwater Valley runners and it was great to see such a large turnout both for the races and also at the pub afterwards! The organisation of the Yateley Series is really fantastic. Ample parking, supportive encouraging marshals and lots of support among and between the runners themselves, all helping each other on to achieve the best they can.